The annual event was hosted by the Port Manatee Security Department on Wednesday [Nov. 9] at the recently completed Port Manatee Emergency Operations Center, located in the Port Manatee Intermodal Building. The Port Manatee Emergency Operations Center was inaugurated in September, when it hosted training for the Lee County Sheriff’s Office waterborne strike team. The center was completed with the assistance of federal port security grant funding. Federal regulations require the U.S. Coast Guard to each year conduct a regional exercise to ensure proper coordination of law enforcement and maritime security personnel to prepare for potential security incidents. Port Manatee was selected to host this year’s event due to its location and the specialized capabilities of the operations center. 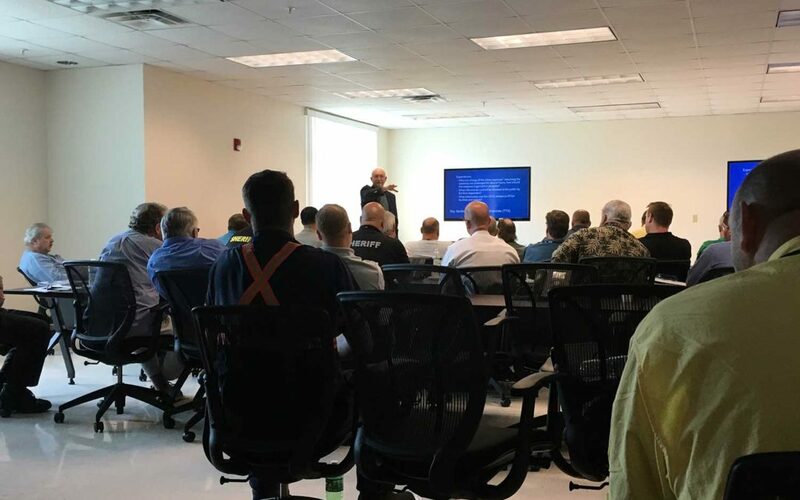 Edmond Morris, a U.S. Coast Guard port security specialist, leads the Tampa Bay area maritime security exercise at the new Port Manatee Emergency Operations Center.